A big batch of pancakes with a side of bacon, still popping and crackling from the heat of the stove? A cup of yogurt with fresh berries and homemade granola? A green smoothie? Or perhaps a bowl of cereal, a protein bar, or a cup of fast-food coffee and a to-go breakfast sandwich? Whatever your answer, if you’re an American, your relationship with food is probably a bit complicated. After all, we’re the land of fad diets, celebrity nutrition experts, reality weight-loss shows, and general food advice – online and offline, solicited and unsolicited, useful and … not so much. If you feel conflicted, overwhelmed, or guilty when it comes to food, you’re not alone. In fact, we surveyed over 2,000 Americans and found that most of us have really complicated relationships with what we eat. If you’ve ever cried over an ice cream cone or eaten chicken nuggets in secret, you’re not alone. For most Americans, the higher the calorie count, the more guilt we feel while eating that particular food. That is, except pasta Alfredo, which had the highest calorie count of anything on our list and didn’t elicit much guilt from those surveyed (maybe because it seems healthier than a cheeseburger to the untrained eye). Perhaps unsurprisingly, food guilt seems to correlate directly with gender. Women report feeling much guiltier about eating anything considered unhealthy. Both men and women, however, feel equally less guilty when it comes to healthier choices like salmon and grilled chicken breast. 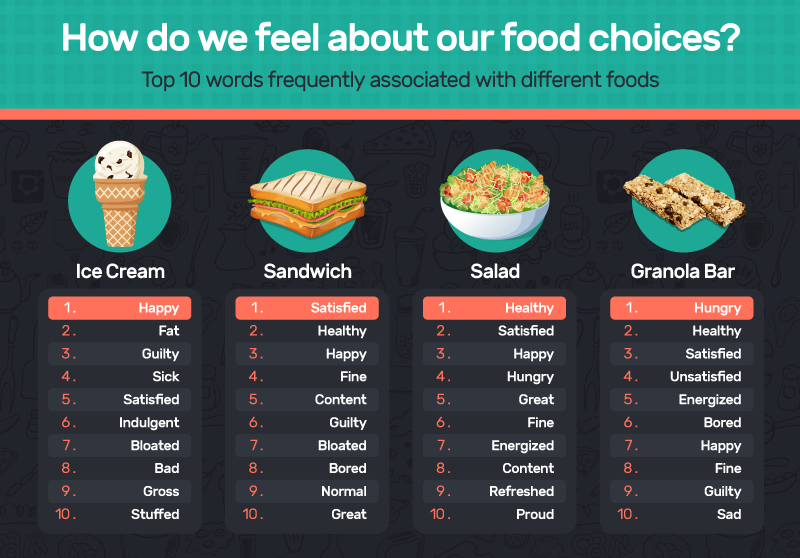 How does a social setting impact how we feel about what we eat? 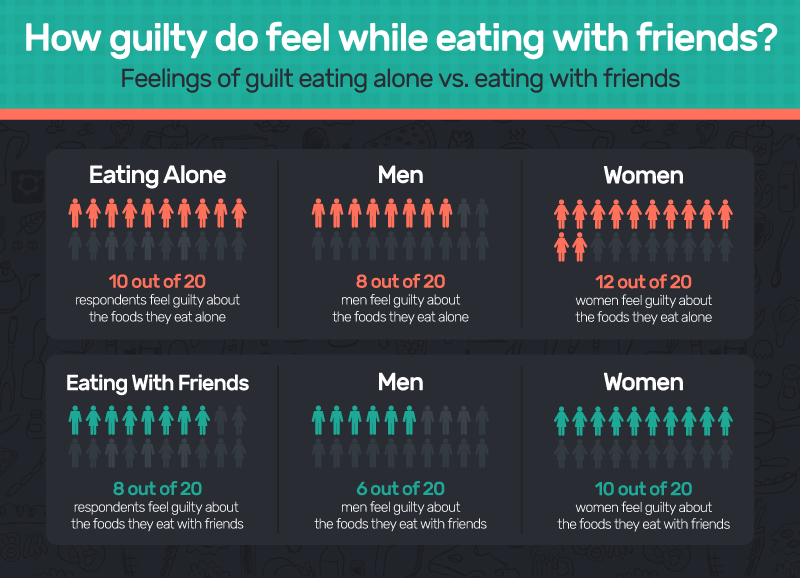 About half of respondents felt less guilty about the things they ate while they were alone, while the other half felt better during group dining. Women are more likely to feel guilty about their eating habits at home, while men are more likely to watch their diets in public. Another interesting fact: The guilt respondents felt about what they consumed in their free time was directly linked to their weight. Survey respondents who were overweight or obese reported much higher levels of guilt when eating alone than those of average weight. With so much pressure and press related to food in the U.S., it’s no wonder that a majority (just over 76 percent) of those surveyed were making some effort to “maintain a healthy weight” with mostly health behaviors. About 10 percent were still trying to stay fit, but using more dangerous methods (e.g., skipping meals and taking supplements). Most respondents were trying to eat healthier and exercise regularly. More than 4 percent of those surveyed said skipping meals was part of their weight loss strategy. This was even more true for those who were obese – bad news according to a recent Ohio State University study, which found that skipping meals may lead to weight gain and insulin resistance in the liver. This trend extended across the other foods we asked about too. Foods seen as “healthy” gave people a feeling of pride and satisfaction, while foods seen as “unhealthy” – such as ice cream – often came with a lot of negative feelings after that first rush of delight. The sheer amount of “health” information in the U.S. can be overwhelming. Some say the most important factor related to health is diet. Others point to sleep habits. Still, others offer up exercise as the definition of healthy. And weight is on a lot of our minds. 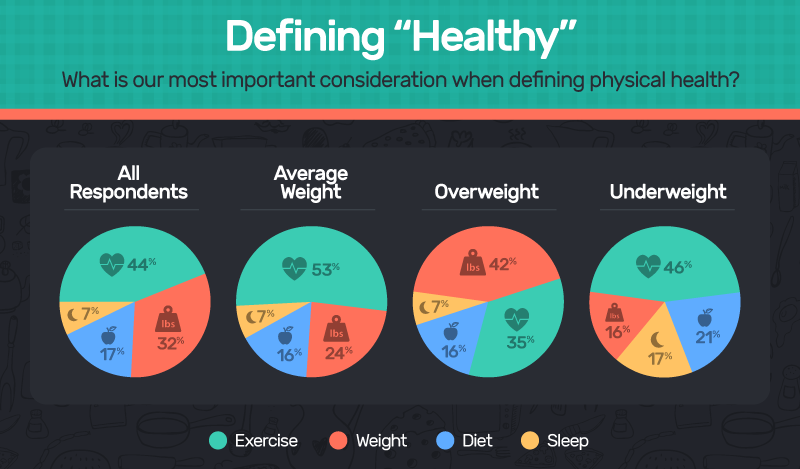 The majority of our survey respondents said exercise was the most important thing when it came to their health. The truth is a little more complicated, however. Exercise can help us reduce our risk of heart disease, dementia, and a variety of other conditions, but it’s not as closely linked to weight loss as Americans seem to think. And, of course, too much exercise can also be harmful, leaving a person depressed, injured, exhausted, or even suicidal. 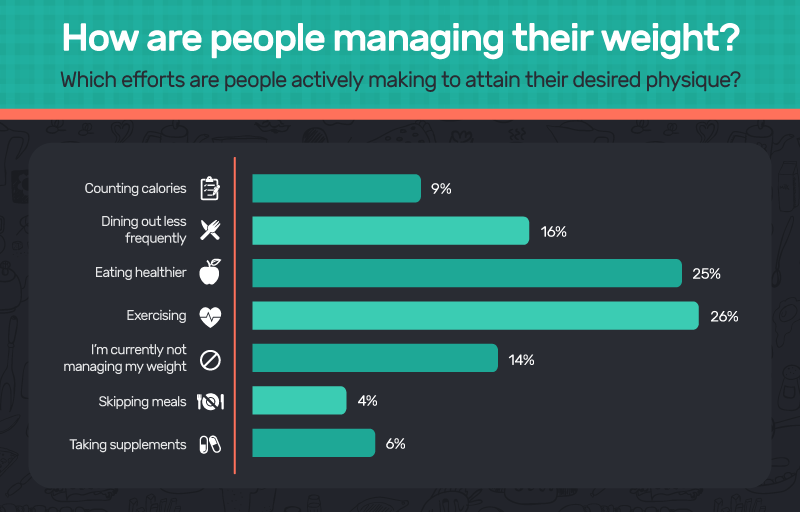 Curiously, overweight survey respondents were very focused on their actual weight, rather than diet, exercise, or sleep. The truth is that weight isn’t the most important factor – not by a long shot. A skinny person can still be at a high risk for health issues. In fact, according to the Journal of American Medical Association, almost one in four healthy-weight people have prediabetes and are what they call “metabolically obese” due to bad diet practices. If you feel guilty when you indulge in a pastry on your way to the office or feel fat after just a few bites of ice cream, you’re in normal company. Most Americans have complicated feelings about diet and weight loss. Perhaps some of this guilt stems from a desire to be healthier – to feel better, to have more energy, to reduce the long-term risks of disease – but some of it is probably due to societal pressure too. Your relationship with your bodies and the food that nourishes it doesn’t have to be this complicated. If you’re feeling overwhelmed by your figure, your food decisions, or the overwhelming impulse to control your life by restricting calories and dieting with other dangerous methods, that’s what Bulimia.com is here for. The assets on this page are free to reuse and share. When doing so, we ask that you link back to the original page so that your readers may see more of the project and methodology.